OMEGA Engineering is pleased to offer a complete line of laboratory pH electrodes. 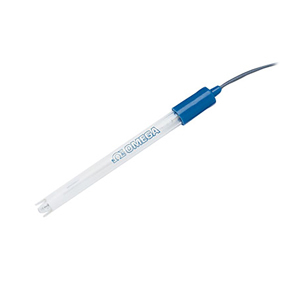 The PHE-4200 Series are gel-filled, combination pH electrodes with a unique clear epoxy body design. With five electrode styles to choose from, you’re sure to find one suitable for your application. OMEGA ® PHE-4200 electrodes offer reliable quality at a reasonable cost. The electrodes measure the entire pH range from 0 to 14 pH units at 0 to 100°C (32 to 212°F) and feature an Ag/AgCI reference and polypropylene liquid junction. Each electrode comes in a soaker storage bottle to keep the electrode moist and ready for use. Shelf life is guaranteed for one year, and the OMEGA quality certificate provided assures that these electrodes meet the most stringent quality control requirements. Note: Comes complete with 750 mm (2.5 ft) of cable with BNC connector and Electrode Care Instruction Sheet.